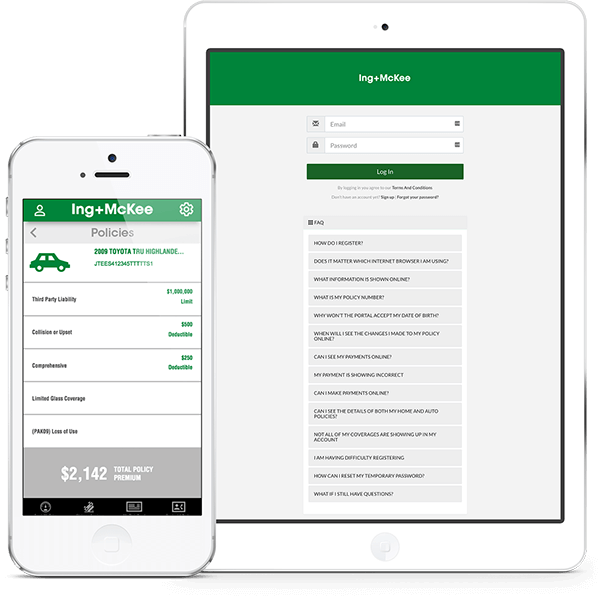 Auto Insurance Has Never Been Easier. We represent over 50 top-rated insurance companies. We get to know you so we can match you with affordable personal and commercial insurance coverage to help you protect what’s important. Protect your biggest asset. Whether you rent or own, make sure your home and belongings are properly covered at a competitive rate from Ing & McKee. Let our brokers find you the right insurance for your car, truck or SUV. Get the right coverage at a price you can afford. You’ve got a business to run. We help you find the right coverage for your needs and we can manage your portfolio so you can rest assured your assets are protected. Don’t leave yourself without financial coverage. Life or disability insurance, estate planning, and more to help protect you and your loved ones against the unexpected. Our insurance brokers are located in four different offices across Alberta to serve you better. Reach us after hours at 403-340-3516. Ing &; McKee Brokers work with over 50 different providers to ensure that you get the right coverage at the best rates available. Manage your account at home and on the go. Our convenient client portal gives you access to all your account information. Log in to the client portal to view your policies, make a claim, call your broker, and more. Available on your desktop or the app for iPhone and Android. For over 90 years, our brokers have worked hard to take the stress out of finding affordable insurance coverage. With such established roots in the community, Ing & McKee is proud to be Central Alberta’s largest independent insurance broker.